3/95 to present: President of Almost Home. Personally performed over 3000 building evaluations for this firm. 2000 to present: Inspector Mentor/Trainer. Mentoring and training of home inspectors & stucco inspectors. 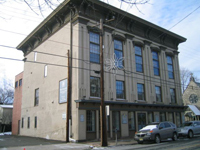 2004 Project Manager for restoration of Fair Haven's Bicentennial Hall, a State and Nationally Listed Historic Site. 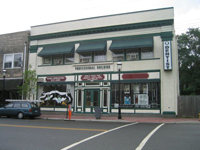 1997 Project Manager for Preservation Red Bank. "Save The Rullman House" committee. 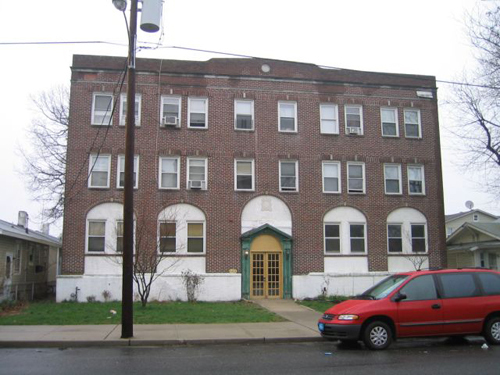 Condition assessment, rehab proposals, grant applications, negotiations with public officials. 1979-1985: Summer work as Carpenter, Mason, Electrician. Gained experience in building trades while earning money for college. 1985-1990: Cosmetic and structural renovations of homes in California. 1992-present: Currently performing a historically sympathetic renovation/expansion on a 100+ year old Victorian house in Rumson. ASHI 2007 Conference - 20 hours of training focused on the new IRC/2006 Residential Building Code. ICC Campus - Online study of the International Residential Code, preparation for building code certification exams. ASHI 2000 Conference - Seminars on Commercial Waterproofing Techniques, Forensic Diagnostics, Legal Issues, etc. (20 hours). ASHI '99 Conference - Seminars on Commercial Roofing & Building Techniques, Seawalls, Moisture, Expert Witnessing, etc. (20 hours). Master's degree in Engineering (sp: materials science, structural analysis) from California Polytechnic University in Pomona, Calif., 1991. GPA 3.8. Thesis: Vibration Modal and Transient Response Analysis of the CaPSET All-Composite Solar Race Vehicle. Bachelor of Science in Mechanical Engineering from Lehigh University in Bethlehem, Pa., 1985. GPA 3.65 Graduated with High Honors, member of Pi Tau Sigma, Tau Beta Pi, Phi Eta Sigma honor societies. ASHI Reporter 4/08-7/08: 4-part series on the ethical problems with pay for referrals. Co-written with Keith Oberg, Chair of the ASHI Ethics Committee. ASHI Reporter 12/03: Chapter Level Legislative Activity and how to work with Lobbyists and Public Relations Firms. Series of articles in The Two River Times 1999 - Old house issues: history, challenges, maintenance, secrets. Monthly articles in the GSASHI Newsletter on home inspection issues and events. Articles included subjects covering homeowners warranty inspections, legislative activity, home inspector licensing, NJ court decisions affecting home inspectors. 20 cover articles from the President. Numerous citations in HVAC and IAQ trade journals on issues of indoor air quality management and climate control. 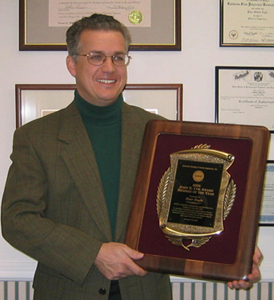 2003-2007 - As ASHI Legislative issues Chair, testified numerous times on Home Inspector licensing at NJ Assembly Regulated Practices Committee and other committees. 2006, 2007 - ASHI Chapter Leadership Day, Chicago - Participated in panel discussion related to ASHI's Code of Ethics. 2005 - Garden State ASHI: EIFS & Stucco for Home Inspectors: 4 hrs. 2001 Preservation Red Bank: Secrets of Old Houses. Lecture on features and fabrics hidden by layers of modern coverings & how to find them. 1998 Brookdale Community College - Homebuyer's education on the buying process, home inspections, maintenance, old house issues. Garden State Chapter of ASHI, 2006-2006, Immediate Past President, 2003-2005 President, 2001-2002 Vice President, 1999-2000 Treasurer. Lecturer presenting seminars on: EIFS (several sessions), report writing, foundation and framing defects, air quality, professional ethics. Organized "newcomer's hour" sessions. Chair of Legislative Action Committee, 2002-2007, Nominating Committee 2006-2007. 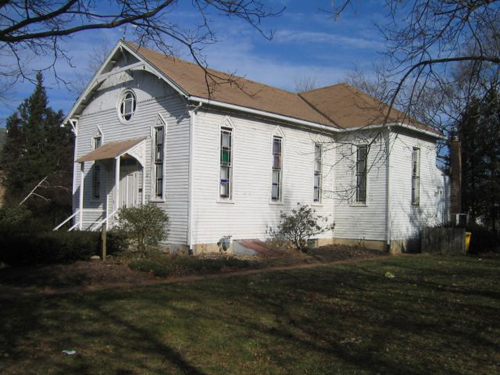 Fair Haven Bicentennial Hall aka Fisk Chapel (Fair Haven, NJ ca. 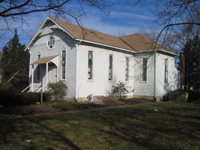 1882 Nat'l Register). Project manager, mechanical engineer. Responsible for management of restoration and rehab project. Wrote successful grant proposal to the NJ State Historic Trust for $227,000 after nine previous failed attempts by others. Administer grants totalling $350,000 and budget of $500,000. Rullman House (Red Bank, NJ ca. 1840) Project manager for the "Save the Rullman House Committee." Responsible for planning and NJ Historic Trust grant proposal. Gatekeeper's House (Red Bank, ca. 1880). Co-authored successful Monmouth County grant proposal for restoration, assisted in restoration management. Historic Allaire Village (Howell, NJ ca. 1835 Nat'l Register): Blacksmith. Volunteer Interpreter and Educator on Historic Ironwork and Blacksmithing. Also provided building analysis, failure diagnosis, and building repairs on several village buildings. La Tourette Mill (Long Valley, NJ ca. 1750 Nat'l Register): Executed new hand-forged ironwork for the millstone crane reproduction. Private commissions: Private commissions for reproduction and period ironwork for private residences: Hardware, architectural iron, structural iron, etc. 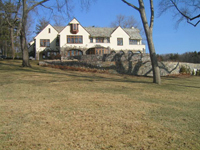 Conover-Crine Houses (Colt's Neck & Marlboro, ca. 1825) Two sister houses built by the same family about 10 miles apart. Condition assessments and repair specifications. 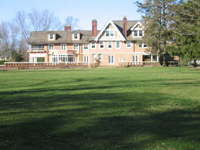 Hendrickson Homestead (Holmdel, NJ ca. 1675) One of the earliest Dutch homesteads in Monmouth Cty. Condition assessments. 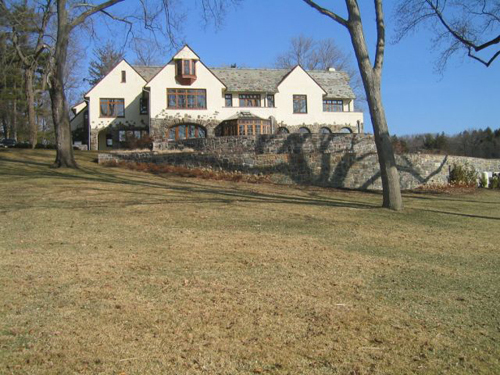 Mirandi House (Rumson, NJ ca. 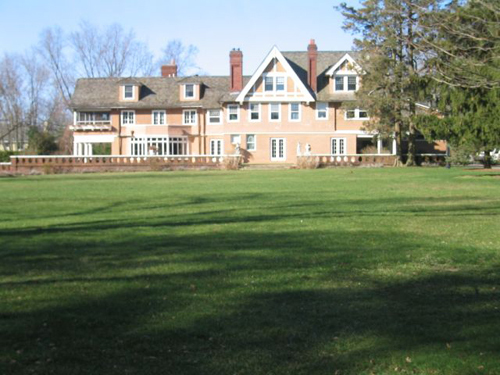 1845) One of the oldest significant residential properties in Rumson. Condition assessment leading to thorough restoration. Poricy Park (Middletown, NJ ca. 1750) House & barn. Consulting on structural and moisture infiltration issues. Performed over 200 home inspections and other inspections and condition assessment services for buyers and owners of residential properties over 100 years old. 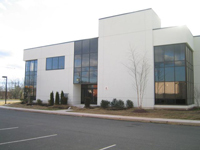 2000 Merck-Medco building, Willingboro, NJ Supervised installation of 200,000 sf of synthetic and traditional stucco. 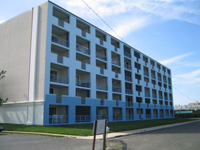 2001 Courtyard by Marriott, South Brunswick, NJ. 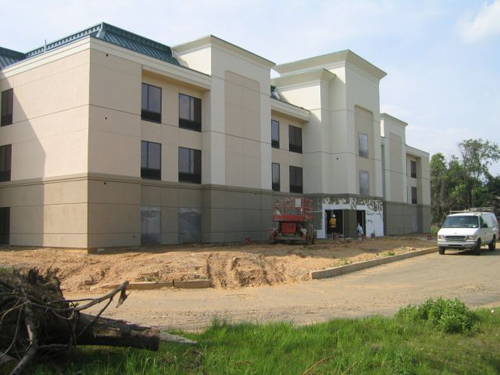 EIFS supervision, 50,000 sf. 2002 Accutest Bldg., South Brunswick, N.J EIFS and stucco supervision, building consulting and construction inspections. 150,000 sf building. 2003 Construction supervision on Hampton Inn and Marriott Hotel buildings in Lebanon and Princeton NJ. 2004-2006 Construction Quality Consultant for Kara Homes. 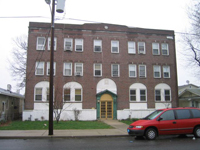 Provided on-site building inspection and quality control services to large residential builder. Major focus of services is on the building envelope and structural framing quality. 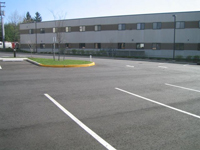 Click on Thumbnails for larger pictures of some of our commercial projects. 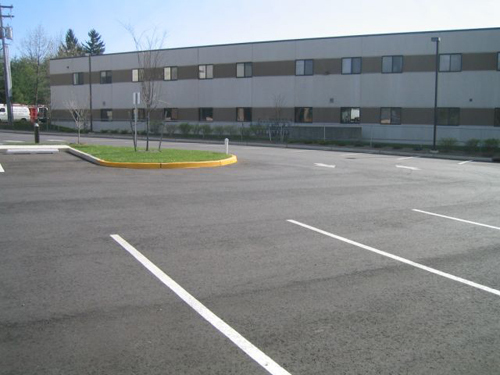 Our involvement in these projects has ranged from consulting and diagnosis of moisture issues, roof issues and other issues to supervision of EIFS and stucco installation and other construction quality control, to complete prepurchase building evaluations. 3/95 to present: Owner/Manager of Almost Home. 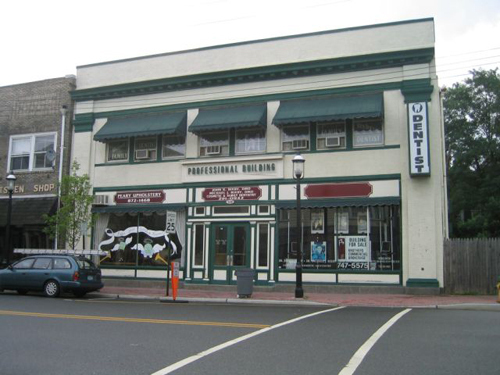 1997-2000 Member of the Executive Committee & Trustee for Preservation Red Bank, an organization dedicated to preservation of the historic character of Red Bank's downtown areas. 1985-1995 Independant work as a fine Artist and interior designer, in New Jersey and California. Art works have been displayed in museums and galleries in Los Angeles, Beverly Hills, New Jersey, and Connecticut.